This is something I had never ever considered as a danger. After all, I’m an adult, I won’t be picking up nuts from the floor so I’ll be fine, right? We are also not in the habit of holding hands, the mother-in-law and I but with small children there could be hand holding, fighting, shoving and general passing on of any nut traces… and they were everywhere. Hazel nuts seem to have had a very good year this year and the harvest is a bumper one. The footpaths and bridleways are carpeted with them, so if your small child is allergic to tree nuts and hazel nuts in particular I would take great care if planning a country walk. Hazel nuts in the kitchen – in the fruit bowl! We had a lovely morning, the sun was shining and apart from 20 minutes working out how to navigate a field full of very nosy, inquisitive and angry looking cows and an electric shock, it was a very pleasurable stroll. The mother-in-law came a cropper from the electrified barbed wire fence she was trying to clamber over and I am ashamed to say I couldn’t quite stifle a laugh. It turned out the cows were waiting to be fed so when the farmer eventually turned up to distract them we sneaked past while they were busy eating, though some kept a weather eye on us as we scuttled across the field. But what happens when your walking companions love nuts? 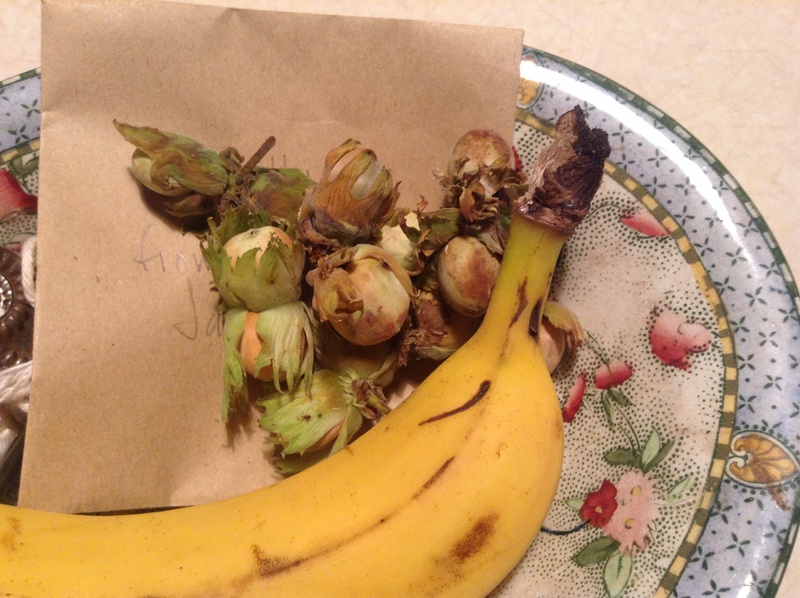 One (mother-in-law) went on a nut collecting mission and collected a feast of ripe hazel nuts. The other was immediately alert and suggesting they go picking nuts another day, when I wasn’t with them, but this kind of fell on deaf ears – literally! The mother-in-law is pretty much deaf and without hearing aid so on she picked. I honestly didn’t mind because as long as I don’t touch nuts I am OK.
And I was fine, but it did make me think about young kids in this situation. I remember at Brownies or other youth group or school trips going into the woods to collect what we could find. For the severely nut allergic child this could pose some serious problems. When we reached the pub for a well earned pint after our four mile walk, she only wanted to put the nuts into the rucksack – the shared rucksack that I had been carrying with my inhaler, adrenaline. Luckily there were two compartments so I suggested she put them in the front empty part of the bag, away from my stuff. If it had been my bag it would be seeing the inside of the washing machine when it got home. Anyone else wary of taking small allergic child walking this time of year? Hazel nut allergy isn’t just an allergen to scour food labels for – they grow everywhere in the UK and are currently dropping to the floor in great heaps. Not eating any fruit now from that fruit bowl!